Say "bonjour" to Black Paris—a one-of-a-kind Black Heritage destination! Today's Art and Food Pairing™ couples a description of an exhibit that I was initially reluctant to go see with a review of an off-the-beaten-path Antillean restaurant. 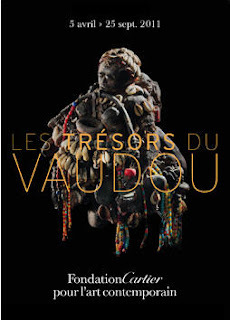 The exhibit, called Les Trésors du Vaudou (Voodoo Treasures), is being held at the Fondation Cartier in the 14th arrondissement. I was ambivalent about seeing it because the works are displayed without reference to their origin or explanation of their function. I queried Entrée to Black Paris Facebook fans about their opinion on this, and those responding also indicated their discomfort and disagreement with the decision taken by the foundation to provide no information about the sculptures (though the Cartier Foundation acted in accordance with the major collector's wishes). I finally decided to go to the exposition to see if my notion that I would not appreciate the works without information about their provenance, etc. would hold true. Upon arrival, I was pleasantly surprised to find that the foundation decided to provide a handout that described the location of origin for each item presented, as well as the materials from which it was made. In my opinion, this compromise was made because too many visitors shared my opinion and those of ETBP Facebook fans regarding the complete absence of information about the individual sculptures. As for the exposition itself, it is sublime! On the ground floor, eight large sculptures are exhibited in front of constructions meant to represent homes, and eight additional, smaller sculptures are shown on two tables. Light is abundant here and the works can be seen clearly (though only one can be seen from all angles). The lower floor houses the lion's share of the works, and here, the lights are quite dim. In the main room, each sculpture is displayed in a transparent case on top of a pedestal so that visitors have a 360° view of it. This is fortunate, because one needs to see the sculptures from every angle to appreciate their complexity and to understand what they might represent. Items are often strapped to the figure's back - examples include a baby on the back of a female figure, and what appear to be spears on the back of a male figure that may represent a hunter. A second room houses a spectacular sculpture montage called Chariot de la mort. It sits on the floor in the center of the room, and is the best illuminated of all the pieces on the lower floor. Crocodile skulls represent the animal power that draws the chariot - each is sheltered by a tiny parasol. Three display cases house additional works in this room. The sculptures are called bocio, which loosely translates into "cadaver - cio - endowed with powers - bo." For believers in voodoo, they serve as intermediaries between the physical and the spiritual worlds. All of them come from Benin. The function of the individual objects is not given in the handout - the foundation provides a "disclaimer" at the entrance to the lower floor and in the handout indicating that the sculptures have multiple uses and that only those who constructed them know precisely what each sculpture contains (powders and potions in vials and gourds, for example) and what it was destined for. However, the handout does contain a brief description of the symbolism attached to various objects used in creating bocio. To view the foundation's photos of several of these sculptures, click here. To learn more, visit our gourmet itinerary page at www.discoverparis.net/gourmet.html or send a message to info[at]discoverparis[dot]net. 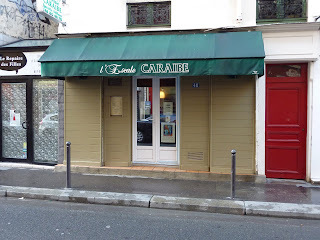 Click here to access our free Paris Insights restaurant reviews! After seeing this exposition, you may well wish to go somewhere nearby and discuss the bocio over a meal. I recommend that you do so at L'Escale Caraïbe, a Guadeloupan restaurant that is approximately a 10-minute walk from the foundation. The restaurant is small, so it is better to reserve your table in advance. 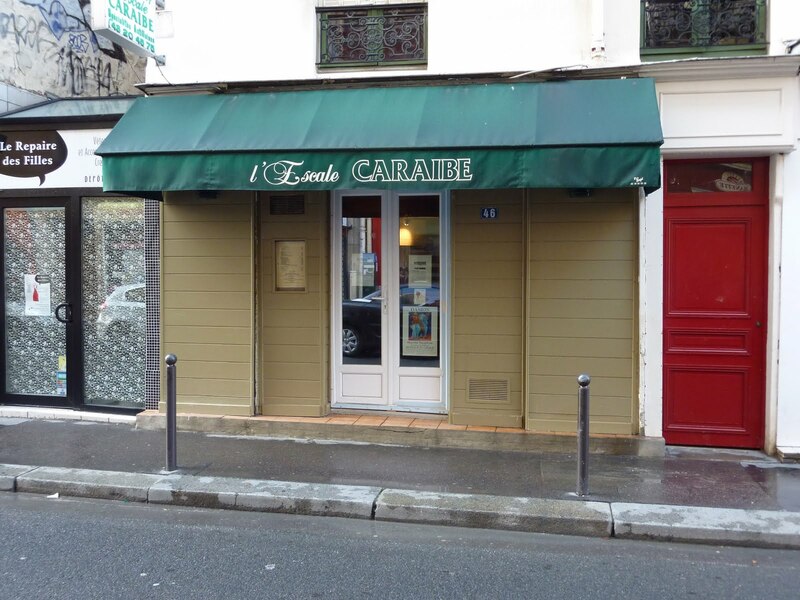 Tom and I dined at L'Escale Caraïbe last Friday. We ordered a piña colada and a ti-punch as apéritifs and sipped them as we perused the menu. This consists mostly of traditional dishes such as boudin, crabe farci (stuffed crab), colombo, and boucané. 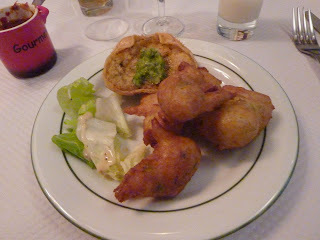 Tom ordered a duo of accras (cod fritters - another traditional dish) and crabe farci stuffed crab as an first course and I ordered boudin antillais. We were both happy with our selections; I was particularly pleased with the smooth, highly perfumed filling of my boudin. The piment (pepper sauce) that was served alongside in a small crock was not overly spicy, which was fine with Tom and me. Regarding the main dishes, I was pleased to see Colombo de cabri (kid goat) listed as a main dish, because I enjoy goat and one never finds it on the menu at French restaurants. (Tom selected this and quite enjoyed it.) But I saw something that I had never seen on a Créole menu before - Croustille de poulet au citron - and decided to try it instead of the cabri. What a delicious meal it was! The chicken (dark meat) was cut into bite-sized morsels and served in a silky, medium-brown sauce that was delectably flavored with lemon. It was tender, juicy, and ever so tasty! The mound of rice served alongside fell into individual grains at the slightest touch of my fork, and the portion was perfectly sized. 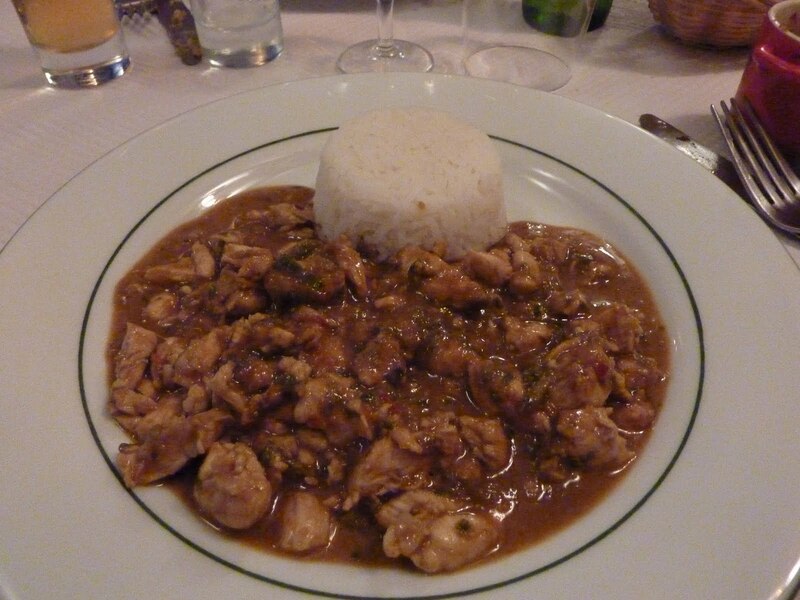 (I find myself overwhelmed by the volume of rice that most Afro-caribbean restaurants in Paris serve.) When I commented to Jean-Claude, the server (who also happened to be the owner of the restaurant), that I found this dish to be uncommon, he said proudly that it was conceived and created in his kitchen! Tom and I were surprised that the restaurant offers no Caribbean beers on the beverage menu. Tom ordered a French beer to accompany his meal and I ordered another ti-punch. We requested a carafe of tap water for the table, and this combination was sufficient for our needs. 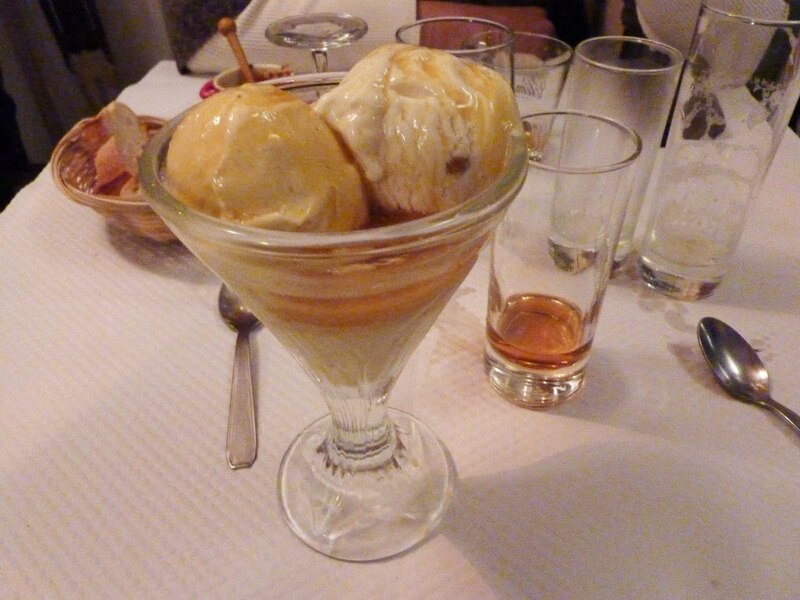 I forewent dessert, while Tom had the Coupe Caraïbe - a scoop of vanilla and a scoop of nougat ice cream in a passion fruit sauce. Because there was no rum raisin ice cream in the house, Jean-Claude offered Tom a serving of rum to pour over his dessert! Service was friendly and reasonably paced, particularly given that a group of 25 persons came in for a party that evening. As an added bonus, the entire meal cost less than 70 euros. We'll definitely return here after the summer holiday is over! Les Trésors du Vaudou runs until September 25, 2011. Opens at 7:30 PM Tuesday through Saturday evenings. 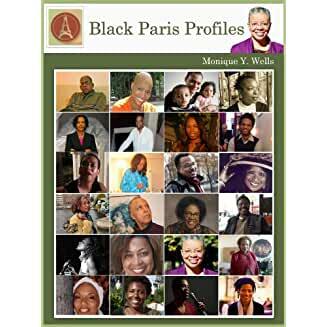 Entrée to Black Paris!™ is a Discover Paris! blog. If you like this posting, share it with your friends by using one of the social media links below! I encourage people of all races and backgrounds who are visiting Entrée to Black Paris™ to read and enjoy the content of the blog! 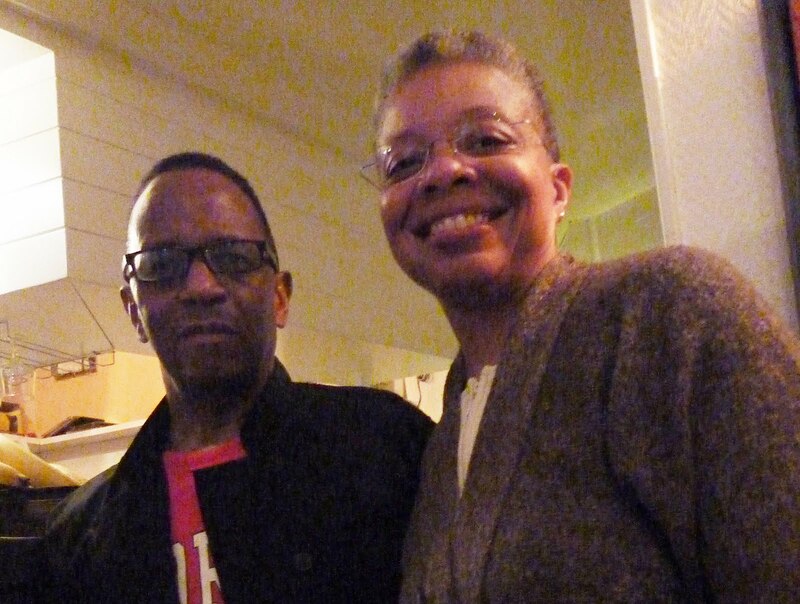 My goal in creating this blog is to increase awareness of Paris’ black heritage among all people – particularly those who already know and love Paris, and are seeking new avenues of exploration to enrich their cultural appreciation of the city. We currently have 13 5-star reviews on Amazon.com! Click HERE to get your copy today! 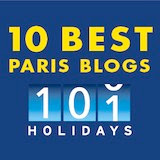 We're proud to be one of 10 Best Paris Blogs ! Be one of the first to know when new Entrée to Black Paris info becomes available!